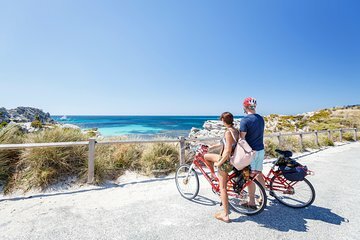 Take a day trip to Rottnest Island, a popular Perth getaway due to its white-sand beaches, secluded bays, scenic bike paths and vehicle-free atmosphere. Travel to the island, just off the coast, by high-speed ferry, and then explore at your leisure with included bike rental. Some options are snorkeling or following the trails to West End, Wadjemup or Bathurst Longhouses, the pink salt lakes or include lunch at Karma Rottnest. When booking, select the option that corresponds to your departure location—either Perth or Fremantle. If you’re departing from Perth, your Rottnest Island day trip starts with the ferry ride along the Swan River, which takes you past luxurious homes and yacht clubs on the water. When you arrive in Fremantle, pick up more passengers; if you select the Fremantle option when booking, you’ll board the ferry here. Then speed across the Indian Ocean to reach the island. As you disembark from the ferry, pick up your included bike rental from the friendly crew. Known to locals as Rotto, the island is beloved for its tranquil, relaxing environment, due largely to its no-cars-allowed policy. Explore the island independently; You might like to settle on one of the 20 bays and 63 secluded beaches or perhaps visit the iconic Wadjemup or Bathurst Lighthouses. Choose to visit attractions such as Lomas Cottage, Rottenest Island Museum or Pilot Boathouse. You might like to ride to the West End where you can stroll along the boardwalk admiring coastal views and lookout for seals at Cathedral Rocks and keep your eyes peeled for humback whales - late September - November. When you stop for breaks, make sure to keep your eyes open for quokkas, the local marsupials who call the island home. Your trip ends with the return ferry ride to Fremantle or Perth. beautiful weather, awesome scenery and quokkas, what more can you ask for. Had a great day exploring the island by bike and saw plenty of quokkas. Fantastic place with breathtaking sights. The snorkelling is excellent and the wildlife is wonderful. Enjoyed every minIt’s of it and the Quokkas are lovely. Rottness is a beautiful island and by having the bikes we were able to find a stunning empty beach . It was a great way to spend a birthday, and plenty of quokkas came out to say hello . We arrived a little late at the ferry terminal and the counter staff graciously put us on the next ferry - ferries to Rottnest Island run hourly from 7.30 to 11.30 but do go earlier than your booking time as they leave quite promptly. We collected our bikes upon arriving at the island and had no issues with the rental equipment throughout. Renting a bike to explore the island was definitely the best option - don't forget to get a map so you know which way to go. the tour was good - great commentary on the boat going across, the bikes were good, snorkels not so - mine was broken around the rubber seal! Island is lovely and managed to see a Quokka. 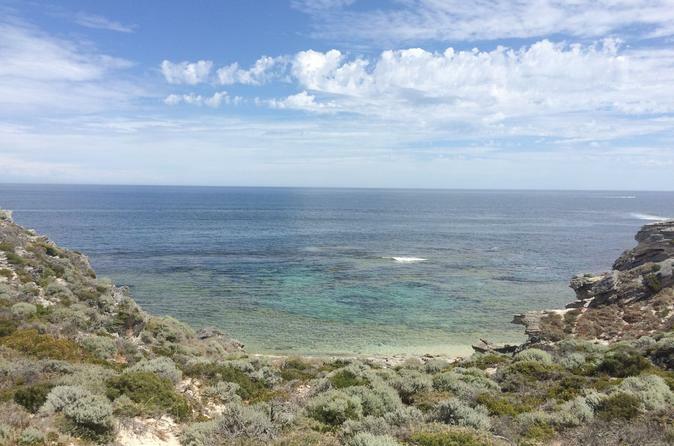 This is a convenient option for getting to Rottnest Island from Perth. The commentary on the way over was useful and made the trip a bit more interesting. Bikes and helmets are handed over as soon as you arrive on the island, so you're good to go straightaway. I would recommend picking up a map beforehand (either from the ticket office at the Barrack St Jetty or on the boat), as it's a bit chaotic once you arrive. Making reservation with Viator is convenient since the ferryservice is crowded. Everydish was realy nice at the buffet restaurant reserved. We went specifically to interact with quokkas and had fun doing so much more. The ferry ride is quite pleasant and biking around the island is some work but the snorkeling spots are worth the effort. Quiet sandy beaches this time of year and not over run with tourists. Nice place to visit if you have the time whilst in Perth. If you want to explore the island you will need a more of transport so the bikes are perfect. The bikes are far from good but they serve a purpose and get you around the island. We did this while on a 3 day visit to Perth. Well worth the money: ferry took us down the scenic Swan River and out into the Indian Ocean, arriving at Rottnest Island. We booked bikes, so when walking off the ferry, were given 3-speed bikes. There are some hills, so gears are essential. Using the map given to us at the ticket booth in Perth, we chose a route and spent the day on the car - free road busses only, and an occasional truck. Stopped at various beaches for a dip, and at lighthouse. Plenty of lunch spots.